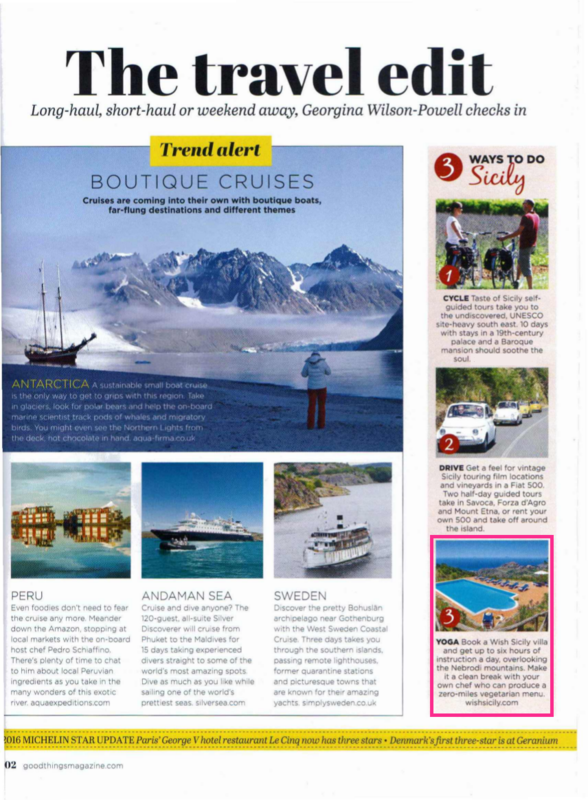 Good to see our yoga villas featured in the May edition of the gourmet food and luxury travel magazine, Good Things. Packed full of great ideas for two of our favourite pastimes – eating and holidays! – the magazine is everyone’s answer to some serious daydreaming. Our yoga holidays are available at a selection of villas in gorgeous settings, overlooking the Nebrodi mountains or vineyards of western Sicily, and include between two and six hours’ yoga each day. For the ultimate feel-good holiday, we can even arrange an in-villa cook to organise your own bespoke detox menu!